The majority of the English-language media outside of India have been notably tentative about accepting the obvious premise that the recent mob attack on eight Indians in the eastern German town of Mügeln was a racist attack. (See the earlier WPR report here.) To the extent they have, however, virtually all have framed the issue of racism and xenophobia in Germany as a specifically "East German problem." CNN, for example, noted that "since German re-unification in 1990, racist violence has broken out sporadically in the poorer east of the country." A Reuters report used a similar formula: "Eastern Germany has seen intermittent racist attacks on foreigners since German reunification in 1990." Both news organizations -- like again virtually all their peers -- also cited the electoral successes of the "far right" National Democratic Party of Germany or "NPD" in eastern Germany as further evidence that the underlying racist ideology that might have motivated the attackers is an East German specialty. Now, although it is certainly "far" something, it can be doubted that the NPD is properly described as being of the "right." Thus, when interviewed by Germany's RBB television in early 2005, NPD business manager and Executive Board member Frank Schwerdt explained: "We prefer a socialist model . . . but a socialism that is directly related to this country: to the nation. That is why we say a 'National Socialism" [Nationaler Sozialismus]. When the interviewer insisted on the phrase, "Is that National Socialism [Nationalsozialismus]? ", Schwerdt replied: "You can call it that." In plainer speech, the NPD is, in other words, a neo-Nazi party and -- though there is as yet no evidence that the Mügeln rioters had any direct connection to it -- there can be no doubt that it is indeed one of the principle vectors of xenophobic ideology in Germany today. Closer consideration of the NPD, however, makes abundantly clear that such xenophobia is anything but a specifically "East German problem." For while it is true that the NPD has registered its most important recent electoral successes in the East, the overwhelming majority of its leadership -- and all of its principle leadership -- come from the West. NPD Party Chairman Udo Voigt comes from Viersen in the western German state of North Rhine-Westphalia. As so happens, Viersen is one of the furthest western points in Germany, lying just across the border from the Dutch town of Venlo. The party has three deputy chairs: Holger Apfel from Hildesheim in the western German state of Lower Saxony; Peter Marx from Elmstein in the western German state of Rhineland-Palatinate; and Sascha Roßmüller from Straubing in the western German state of Bavaria. The below map shows the distribution of the hometowns of the membership of the NPD Executive Board or "Vorstand." 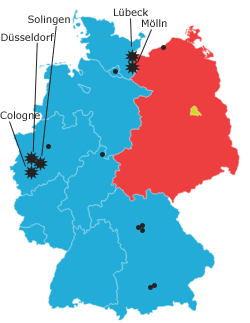 The area in blue represents the territory of "West Germany" or, in other words, of the Federal Republic of Germany prior to German reunification. The area in red represents the territory of "East Germany" or, in other words, of the former German Democratic Republic. The area in green represents West Berlin, which, though situated in the heart of GDR territory, was under western administration. The stars mark the hometowns of the party chairman and his three deputies. The affirmation of CNN and Reuters that anti-foreigner violence in eastern Germany since reunification has been merely "sporadic" or "intermittent" is, moreover, both obviously false and highly misleading. It is false, because xenophobic and racist violence has been a grim feature of everyday life in Germany for many years now, and it is misleading, because this is not only so in the East. According to the official statistics (pdf file in German), what German authorities likewise label as "right-wing" extremists -- meaning, as a rule, neo-Nazis and like-minded skinheads -- committed some 1047 violent crimes in 2006. Of these, some 484 are identified as being xenophobic in nature and another 43 as anti-Semitic. Because German authorities display a marked tendency not to classify particularly heinous crimes as xenophobic, among other reasons, the real number of racist and xenophobic attacks in Germany is surely higher. Mölln, 1992: The homes of two Turkish families are set on fire with Molotov cocktails. A woman and two young girls, aged 10 and 14, die in the flames. Nine other people are injured. Two local neo-Nazis will be charged and convicted for the crime. Solingen, 1993: Two women and three young girls, aged from 4 to 12, die in an arson attack on a home occupied by two Turkish families. Another 14 people are injured. Two known neo-Nazis and two other local youngsters, the youngest being merely 16-years-old at the time of the crime, will be charged and convicted. Lübeck, 1996: Ten people die and another 38 are injured in an arson attack on a residence for asylum-seekers. Four members of the neo-Nazi scene from the nearby, eastern German, town of Grevesmühlen are taken in for questioning by the police shortly after the crime. The hair of three of the men has been singed. In the ensuing years, one of the four men from Grevesmühlen, "Maik W.", will repeatedly confess to the crime. Nonetheless, charges are never brought against them. 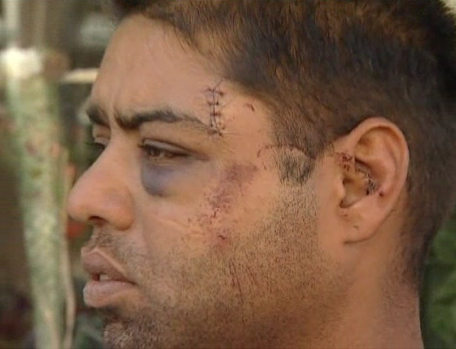 Instead, charges will be brought against Safwan Eid: a young Lebanese man who lived in the residence. Safwan Eid will be tried twice and acquitted both times. Düsseldorf, 2000: A homemade cluster-bomb is detonated on the platform of a railway station. Ten immigrants from the former Soviet Union who frequent the station, most of them Jewish, are injured. A five-month pregnant Jewish woman from Ukraine has her leg ripped off in the explosion and her unborn child is killed by a bomb fragment that pierces her womb. No charges have ever been brought. Cologne, 2004: A bomb filled with nails is detonated in the Keupstraße: a busy commercial street, which on account of its preponderance of Turkish-owned businesses is commonly known as "Little Istanbul." Twenty-two people are injured, four seriously. All but one of the injured are of Turkish descent. No charges have ever been brought. Politically significant attacks on residences for asylum-seekers and for foreign workers occurred also in the East German towns of Hoyerswerda and Rostock in 1991 and 1992 respectively. In neither case, however, were there life-threatening injuries or deaths. To the above should be added a series of murders of eight shop and snack-stand owners of Turkish descent and one Greek between 2000 and 2006. (See my "Clueless in Germany.") The same pistol was used in each of the murders and largely the same modus operandi, with most of the victims being shot in the head. All but one of the incidents occurred in western Germany. No suspects have been identified. The locations of the most notorious arson and bomb attacks are indicated in the map below. The locations of the nine shootings in the murder series are likewise indicated by black dots. The recent gangland-style murder of six Italians in Duisburg in North Rhine-Westphalia displays certain similarities with the previous incidents in the murder series. One of the previous shootings, moreover, occurred in North Rhine-Westphalia, as did three of the five most notorious arson and bomb attacks. The German media have, however, been quick to posit a mafia background to the latest incident. The local police, by contrast, continue to insist that they are following all leads. No information has been released about the murder weapons. *These findings are based on the biographical information on the NPD Web site and Wikipedia Germany, as well as other publicly available sources. Where a place of birth was not readily available, I have substituted the place of the earliest identified non-NPD-related activities.